Natural disasters are terrible any way you slice it. Hurricane Sandy was a particularly devastating storm for people in the Northeast. My heart goes out to those people affected by the storm, especially those who have lost loved ones. Having grown up in New Jersey, I still have many friends who live in that area, including a cousin who’s in-laws have a house on the Jersey Shore that is underwater. Some of their neighbors’ houses were completely wiped away by the surge. Aside from the obvious personal and financial damage from the storm, one downside of natural disasters that particularly irks me is the inevitable bad economics and political grandstanding that fills the airwaves after such an event. It bothers me because it is a self-destructive response that has real negative consequences on people’s lives and that it is completely avoidable if people only took the time to understand basic economics. There are the Keynesian economists like Paul Krugman who jump at the chance to decry that the storm, while bad, will at least stimulate economic activity, so there is a bright side. This dumb idea, known as the “broken window fallacy” has been well explained and debunked by economists like Bastiat and Henry Hazlitt. Then there are the big government lovers who pound the table that we need to expand FEMA and other federal programs to aid disaster victims. These include the politicians who like to show how caring and generous they are by pledging to spend (other people’s) money to help the victims. But as Katrina demonstrated, FEMA is just another bureaucracy that hinders real aid from occurring. The government programs for flood insurance subsidies and other programs create a moral hazard that encourages people to build in risky areas. The topic of how Federal programs for disaster victims are negative to society and how the free market can, and has, handled disaster relief much better could fill a book and is not the point of this essay. The topic I want to address here is “price gouging” because it always comes up, and it seems so obvious to people that raising prices on essential goods when people are already in a desperate situation is just evil. In fact, far from being evil, it is simply a market response that helps get goods and services to people who need them most as efficiently as possible. OK. Let’s say the store owner wants to be nice by not raising his prices but also be smart about it by limiting customers to just one pack a day so everyone can have a chance to get them. Well, the people who need more than one pack immediately won’t be able to get them in time. They will have to come back tomorrow, spending valuable time getting batteries when they could be shoring up their property. They might bring their kids and friends to wait in line with them. Long lines develop and people waste time and resources waiting in line. This is true anytime an essential good is rationed, either by acts of nature or government decree. 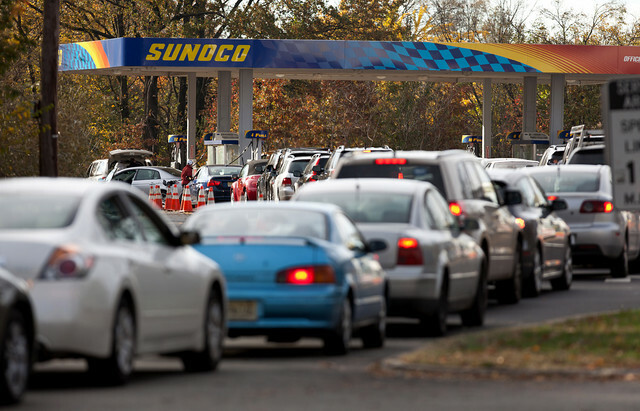 Many remember long lines for gasoline when it was rationed in the 1970’s and those same lines are appearing today in New Jersey. This scenario is better than some people having no batteries (or gas) at all, but still very inefficient. That entrepreneur from the first example may simply pay some kids a few bucks to wait in line and buy batteries for him so he can sell them down the block, similar to how many ticket scalpers operate. Gas line in New Jersey. As inefficient as the store owner not adjusting his prices and/or rationing sales is, it’s much better than when the government passes a law or temporary rule to fix prices or ration goods. At least the store owner knows a bit about his customers and how many batteries they may need and can adjust his allotment if supplies start to run thin or he expects a new shipment soon. He can make an exception if a nurse walks in needing to purchase 20 packs of batteries for hospital equipment. If he is restricted from raising his prices, even though it costs more to get new batteries over flooded roads, he will lose money and his supply lines will dry up. With a top-down government decree, there is no feedback loop from the market. It’s all arbitrary price and ration levels set by someone not intimately involved. Not to mention the moral issue of a government telling one individual who wants to sell a battery to another individual who wants to buy that battery, that they are not free to make that voluntary transaction. So… if price controls and rationing aren’t ideal, how would the free market handle things? First, the store owner would raise prices to more closely match the demand for batteries with his supply. The market might dictate that in this situation he could raise prices to $20 a pack. $20 dollars for a pack of batteries? That’s gouging!!! He’s taking advantage of these poor people’s situation. Well maybe, but raising prices to what the market will bear to maximize his profits has several advantages. Second, the higher prices will make people think twice about how many batteries they buy. If the prices are normal there’s no downside to buying more than you need just in case. If prices are $15 instead of the usual $5, people will only buy what they absolutely need, leaving more batteries on the shelf for the next customer who really needs them. In other words, people buy only what they need and everyone can get exactly what they really need. Sure, they may pay a bit more for a few weeks but does an extra $10 really matter when you desperately need light? Third, since he’s selling batteries at or near the market price, there’s no incentive for a black market to develop such as someone buying up all the batteries and then selling them around the corner for $15 when he might get stuck holding a bunch of overpriced batteries. 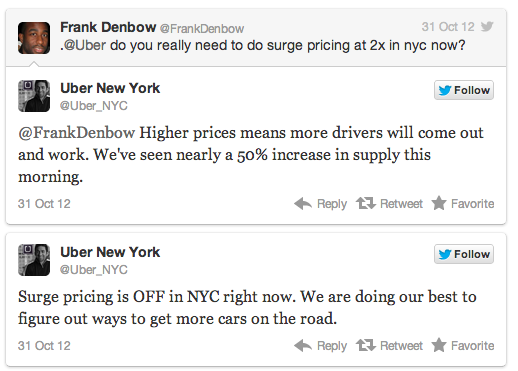 Uber explains how increased prices increases supply. The last tweet shows the negative affects of well meaning price controls. 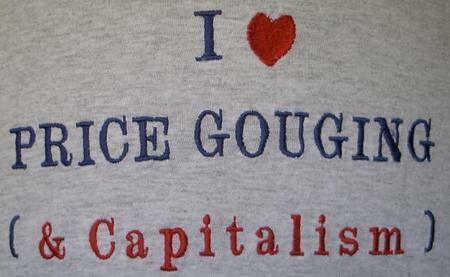 If we dig a little deeper we find even more advantages to the free market. When battery suppliers in Pennsylvania get wind of the fact that batteries are selling in New Jersey for $15 a pack, they will load up their trucks and brave the flooded roads to deliver more batteries to that area. Even if they are doing it out of their own greedy desire for profit it doesn’t matter, as the net result is that more batteries will quickly flood (no pun intended) into a region that desperately needs more batteries. This influx of supply helps bring down prices. If batteries had stayed at $5 there is little incentive to take the time, effort and risk to drive to a dangerous, flooded area when they can sell batteries for $5 out of the comfort of their store. If we dig even deeper we find a tertiary benefit. If people know that batteries (or water, or toilet paper) are going to become very expensive in the case of an emergency, they are more likely to stock up on those items during normal times. Then when the storm hits, there will be less of a spike in demand for essential goods so people who really need then can get them without having to pay a huge markup. It’s the markets way of helping people plan better for disasters. This is the opposite of the moral hazard that develops when the government distorts the market. This example discusses batteries but the same is true for other essential goods and services such as water, gasoline, generators, construction workers, electricians, or anything else that is in demand. And while the article mainly discusses price controls and rationing, the same principles apply to any instance where the government distorts the market and doesn’t let the free market operate. Like in Katrina, when volunteers flocked to help, but were turned away by FEMA officials, or when perfectly good trailers and other temporary housing arrived days after the storm but couldn’t be used because it hadn’t been pre-approved by government officials. Or in New Jersey where stories are already emerging of electricians and other volunteer workers being turned away because they weren’t in the local union. It’s always the same. The free market works better than well intended government “solutions” no matter how many pundits and politicians want to take advantage of a disaster to demonize it. This entry was posted in Community, Economy and tagged broken window, FEMA, gas prices, gouging, price controls, price gouging, rationing. Bookmark the permalink. Excellent Article….never thought about it in this context…..makes perfect sense!!! That statement is in opposition to your premise. No one is evil for simply buying low and selling high in response to market demands – regardless of there status as a “store owner” or “enterprising person”. I couldn’t agree more. By putting (evil) in parentheses I was trying to show how some people might consider them evil just for doing something rational. I agree that it’s not really that clear the way I wrote it so I’ll edit it. Thanks for engaging with the article. Reminds me I need to start writing again.